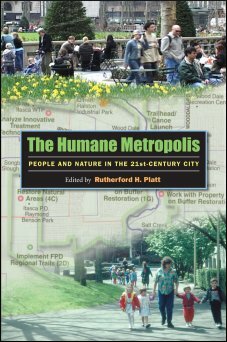 So what is a “humane metropolis”? The key words seem to be green, healthy, sociable, civic, and inclusive. That means renewed attention to welcoming urban parks, from entire “green necklace” systems within metro areas to the emerald-green sanctuary of small vest pocket parks. Community gardens, green roofs, street trees and planted medians all count — and today more than ever as antidotes to the “urban heat island” phenomenon and the spread of global warming-inducing greenhouse gases. The book also describes efforts such as greenways and physically separated cycle tracks that can encourage more cycling and connect people to places, as well as daylighting streams and more. Great post and thank you for the recommendation on this book. It’s excellent.